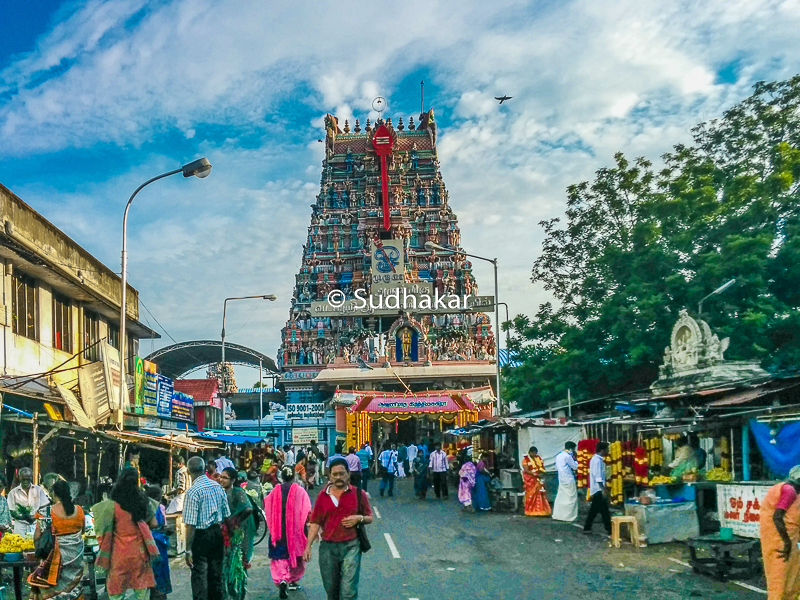 The Temple: Origin of this temple is said to be around 1890.The entrance to this temple has a Rajagopuram adorned with images depicting stories from the Skanda puranam. There is a big gold plated Kodi Maram as you enter from the east entrance. In front of the temple is the temple tank. The southern tower,that is accessible from the main road with shops on either side, rises to a height of 40 metres. As you enter from the main entrance or the south entrance, you can see the Varasidhi Vinayagar sannithi on the left. Towards your right are the counters for selling special entance tickets,pooja,abishekam,wedding ceremony booking tickets. Inside the central praharam , in the garbha gruha ,Lord Subramanya or Muruga is seen in a majestic standing posture facing east. As you come around the main sanctum, you can see Dakshina Murti, Chandikeswarar, Mahalakshmi, Ganesha in various forms on the outer wall. In the left of the corridor, you can see the Nayanmars, Shiva Lingas, Muruga with his consort Valli and Deivanai. The outer praharam has a spacious hall used for marriages and religious discourse. During auspicious months as many as hundred weddings on a day takes place in this hall. In the outer praharam, there are sannidhis for Shiva in Lingam form, Meenakshi, Arumugan who is the Utsavar deity here, Arunagiri Nathar and Anjaneyar. On the South of the praharam, behind the shops selling prasadams and devotional books is the sannidhi for siddhars. 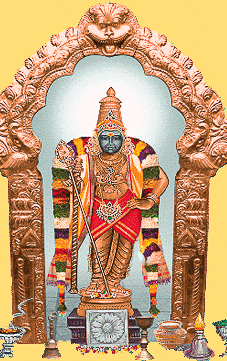 As Lord Muruga is the deity for Angaragan or Sevvai (planet Mars), there is a sannidhi for the planet in this temple. The temple premises are maintained by Hotel Saravana Bhavan and the premises are always very clean in spite of the heavy crowds everyday. There is also a free cloak room for your footwear maintained by Hotel Saravan Bhavan at the south entrance of the temple. Pooja & Festivals Pooja to the main deity are performed five times a day starting from 5:30 in the morning.The last artha jama pooja is done at 9:00pm. 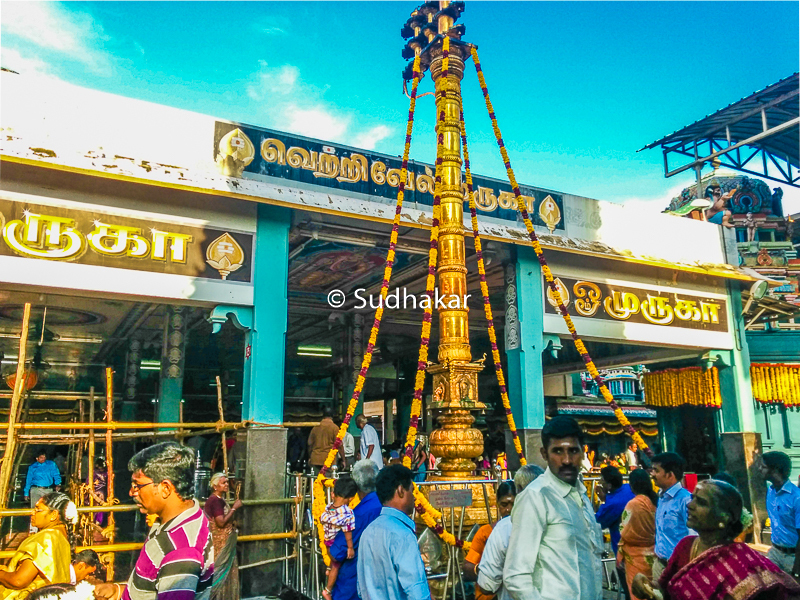 Vaikasi Visakam in May-June, 6 day Aipasi Skanda Sashti in October-November, Panguni Kruthika Laksharchana in March-April with 3 day float festival are grandly celebrated in the temple. Temple location It is situated in Vadapalani, Chennai. How to reach? Vadapalani is well connected by Metro rail, buses and easily accessible by cars and autos. Parking near the temple can be a real challenge during festival days and muhurtham days. Where to Stay? Chennai has many star hotels,deluxe,semi deluxe andeconomy hotels.